In conjunction with the grand opening, the Law Library is pleased to launch its “Guide to Using the Stephan Kuttner Institute of Medieval Canon Law Library.” The guide was prepared by our 2015 Rare Book Fellow, Anna Franz. The “Guide” gives an overview of the collection and its history, and then describes each of its components. The most significant of these is the collection of over 700 microfilm, microfiche, and photocopy reproductions of medieval canon law manuscripts. In one location researchers can consult manuscripts from libraries scattered across Europe and North America. The Kuttner Institute’s book collection of over 2200 volumes is a valuable reference tool for those using the manuscripts and for anyone studying the history of canon law (browse the collection via this link). The collection also contains over 15,000 offprints of journal articles, many of which are still not available online and which constitute an extensive repository of scholarship. The “Guide” also directs researchers to the Law Library’s own extensive collections on canon law, including current scholarly monographs and the Rare Book Collection’s rich canon law holdings. 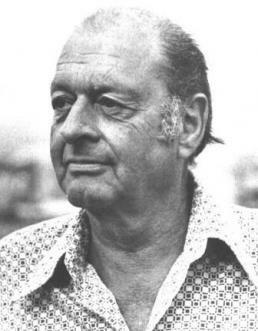 The Law Library is delighted to take custody of the Kuttner Institute’s library and looks forward to assisting its users. If the “Guide” doesn’t answer all your questions, ask one of us! In my search for law books with illustrations, I have never come across botanical illustrations until now. 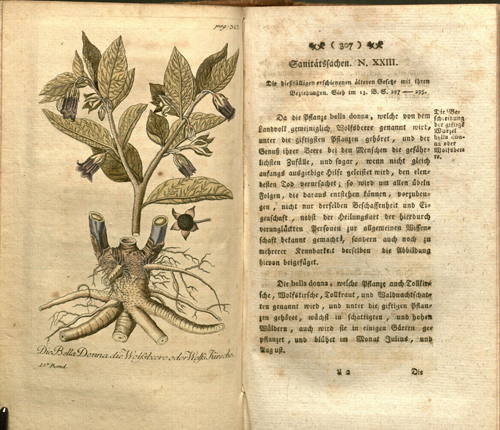 The plant depicted here is belladonna, also known as deadly nightshade. The leaves and berries are highly toxic, although the plant is also used in a wide variety of medicines. The Handbuch contains the enormous legislative output of the reform-minded Joseph II. He freed the serfs, abolished the death penalty, ended press censorship, instituted religious toleration, and reformed public administration, among other things. Many of his reforms were rolled back after his death. All 18 volumes are available online, courtesy of the National Library of Austria. One unusual and attractive feature of the Handbuch is that each of the 18 volumes has a different allegorical frontispiece and engraved border on the title page. You can view all of the frontispieces in an album on our Flickr site. Below is the frontispiece of the last volume, volume 18, published in the year that Joseph II died. It shows a soldier mourning his leader’s death. The Yale Law Library’s collection of early Italian statutes is the largest outside of Italy. One of its strengths is its manuscripts. A list of them, “Manuscripts in the Italian Statute Collection, Yale Law Library,” is now available in the Yale Law Special Collections section of the Yale Law School Legal Scholarship Repository. The list is arranged alphabetically by jurisdiction (usually a city or town). It gives descriptions of 74 manuscripts. Most of them are municipal statutes that govern both civil and criminal matters. A few contain the statutes of guilds (pharmacists of Naples), or statutes covering specific subject areas such as criminal law (Bregaglia Valley), commercial law (Città di Castello, Florence, Montefortino), fishing (Perugia), tariffs (Bologna), or agriculture (Tivoli). They date mainly from the 15th to 18th centuries. 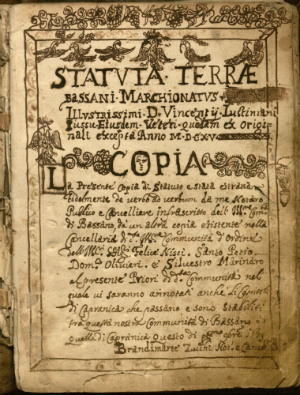 One example is shown at left: the 1615 compilation of the statutes of Bassano del Grappa, a city in northwest Italy that was part of the Republic of Venice for much of its history. Ernest Hemingway lived in Bassano while he was driving an ambulance in World War I. The list also includes 24 print titles because they contain significant additions in manuscript. Printed editions of municipal statutes were expensive to publish and had a limited market, so only the most important and populous cities, such as Milan and Venice, published frequent updated editions. For printed statutes in other cities, it was easier and less expensive to update the copies in manuscript. Below is one example from Novara, Statuta civitatis Novariae (1719). From a book history perspective, these volumes are interesting because they straddle the boundary between manuscript and print.